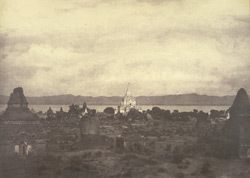 Photograph by Linnaeus Tripe with a distant view of the Gawdawpalin temple in the Pagan (Bagan) region of Burma (Myanmar), from a portfolio of 120 prints. With this portfolio of architectural and topographical views, Tripe, an officer from the Madras Infantry, created an early photographic record of Burma. The 1855 British Mission to Burma was instructed to persuade the Burmese king Mindon Min to accept the annexation of Pegu (Lower Burma) following the Anglo-Burmese War of 1852. It was also the intention of the British to collect information about the country. They travelled in Burma from August to early November 1855, stopping at various places to allow Linnaeus Tripe, the official photographer, and the mission's artist, Colesworthy Grant, to perform their duties. Capital of the first kingdom of Burma from the 11th to the 14th century, Pagan is one of the most important archaeological sites in South East Asia, with the remains of over 2000 stupas, temples and monasteries scattered over a 30 km radius. One of the most beautiful and graceful of Pagan's temples, the Late Period Gawdawpalin or Throne of Obeisance was begun in the reign of Narapatisithu (1174-1211) and completed by Nadaungmya (ruled 1211-34). Tripe wrote, 'Taken from the top of Thapinyu. [That-byin-nu]. The ruins of all shapes and sizes seen in this view, give an idea of the manner in which they are scattered for about eight miles along the river [the Irrawaddy], to a depth of sometimes three miles'.